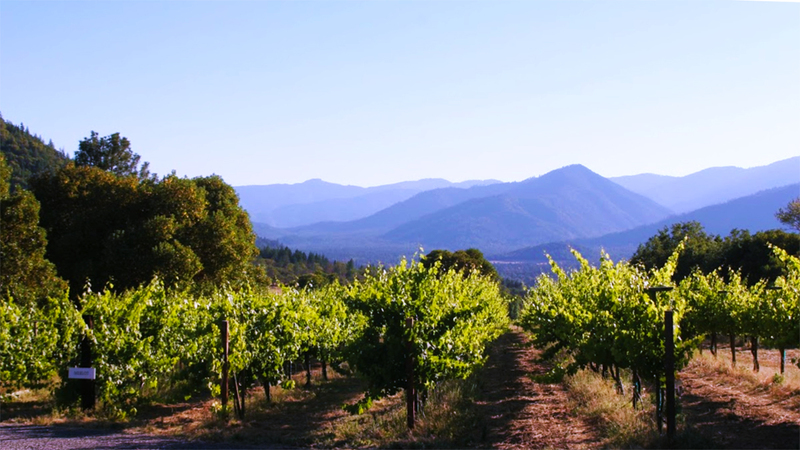 Spend a memorable and relaxing day exploring the tranquil and scenic countryside while touring Southern Oregon’s boutique wineries with the Discover Oregon Wine Country package. Additional nights are available at a discounted rate. Guests must be at least 21 years old upon check-in. A 72 hour cancellation policy applies. 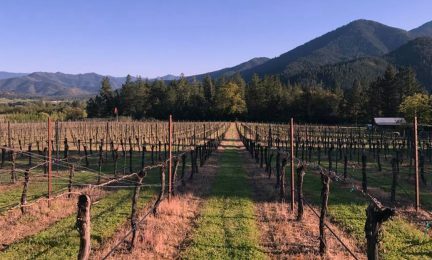 This package is available year round, however, during our slower “off season” (October – May), some wineries have limited hours. A full list of participating wineries and current hours of operation will be provided on arrival. As an avid explorer, dreamer, road-tripper, adventurer I thought “how quaint, they have a wine trail.” I was in store for so much more. 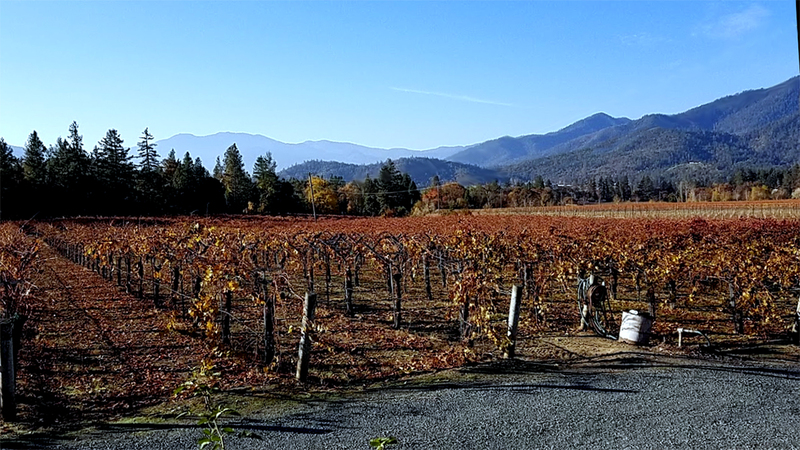 Departing late morning, I traveled north out of Jacksonville up highway 238 to check out the Applegate Wine Trail. Its a rural two lane country highway with broad sweeping curves and light traffic. About 8 miles outside of Jacksonville I came into the one-horse town of Ruch. There I found the first road substantial enough to have a left turn lane. Per the advice of the incredibly helpful front desk attendant, I turned left and found myself at Valley View Winery. Before going much further, I should mention that I very much enjoyed the tastings, but I am by no means an aficionado. Here is what I experienced. I found Valley View to be a lovely vineyard and tasting room. The service was exceptional, and I very much enjoyed a selection of their white wines. 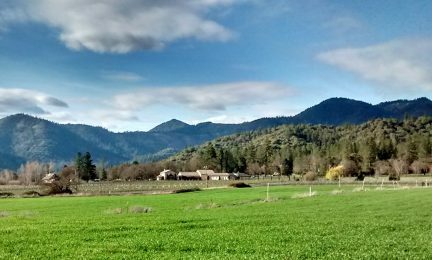 I learned that this was the site of the first Southern Oregon Vineyard, established by the namesake of the popular Britt festival. 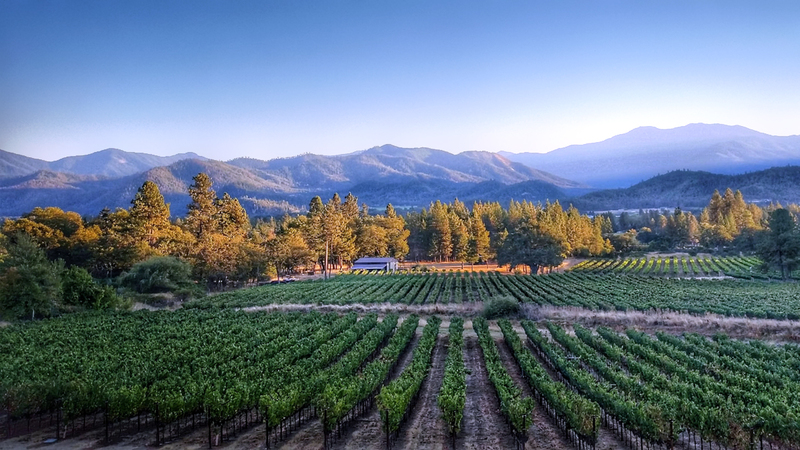 It had shut down during prohibition and was re-established in the 1970’s when the winegrowers were reminded of the unique qualities of climate and soil had to offer in producing high quality wine grapes. Being rather partial to them, I sampled the white wines first. The Anna Maria Viognier was light and fresh, it tasted like spring – if spring were a flavor. When I sampled their Rogue White, a variety of favorite spring and summer food dishes came to mind as excellent pairings. This would be a great wine to enjoy basking in the sun on a summer afternoon, perhaps with fresh strawberries, citrus salmon, or my favorite summer salad of; spinach, ricotta, pine nuts, sun-dried tomatoes, lime seared chicken and roasted artichoke hearts. It was still before noon, and with all of this daydreaming about yummy foods I quickly realized that if I’m on a wine tour, I should probably break for lunch. Valley View had a menu selection, but I had packed a special picnic lunch to stay on my diet. 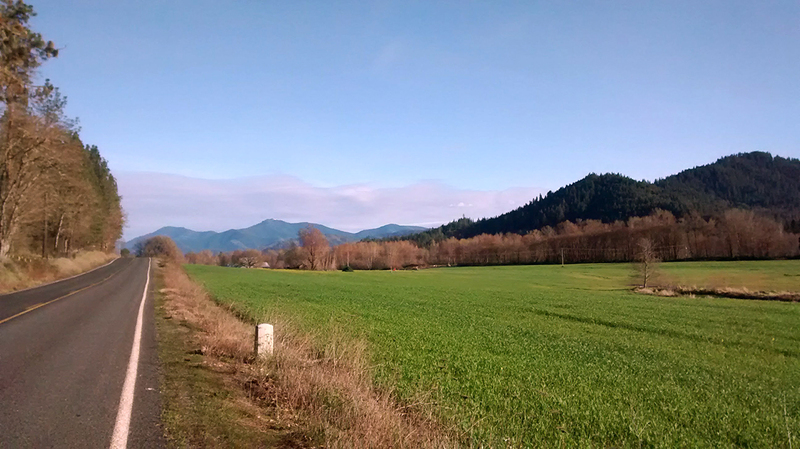 I carried on up Upper Applegate Road for about a mile or so before turning right and following the signs to Cantrall Buckly County Park. 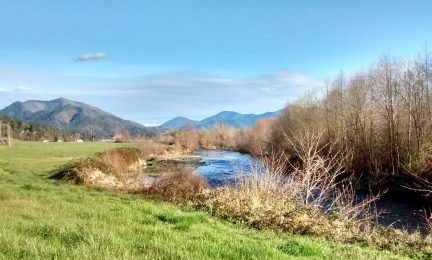 This lovely park on the Applegate river was a great place for a picnic lunch and capturing some photos of the local wildflowers. I saw that Cricket Hill Winery was close by, but their tasting room is in the ground floor of the McCully House Inn where I’m staying, so I decided to venture on to the other area wineries and sample the offerings of Cricket Hill when I returned to the Inn. The road to Cantrall Buckly put me back on highway 238 and on my way to the rest of my adventure. 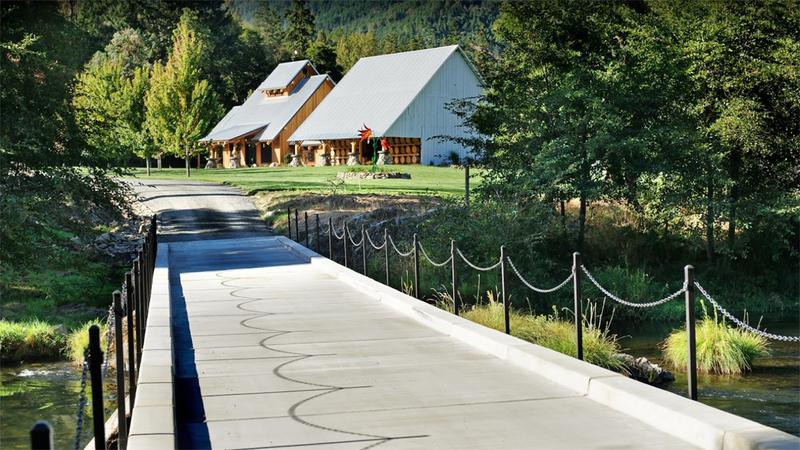 The side route to the park bypassed a small winery (Fiasco), but my trip was in the early spring, I had called ahead as recommended and learned that their tasting rooms were not open yet. My next trip, I’ll be sure to check them out. Next, I found myself pulling into Red Lily Vineyards. What an enchanting place! 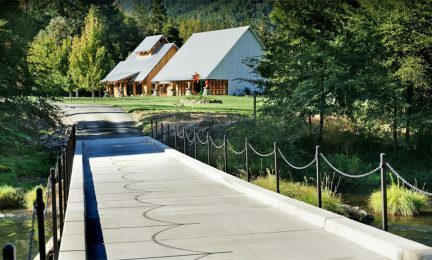 It is tucked right along the Applegate river with breathtaking views of the valley, beautiful landscaping, and a sophisticated yet rustic feel that really brought together the feeling of fine indulgence with rustic country agriculture that would stay with me throughout the rest of the tour. If I were to marry again or just run away from it all, the fine hosts at Red Lilly would likely find me on their doorstep. Truly beautiful, serene, happy… They featured mostly deep, bold red wines. I sampled their Red Lily Temparanillo, which paired beautifully with decadent coca dusted rich chocolate truffles. In talking with the staff, when they learned I had a slight preference for whites, they provided me a sample of the Stargazer Lily Verdejo, a perfect light white wine for walking barefoot along the river. I could see serving this in the early afternoon at summer parties with fresh sliced fruits. 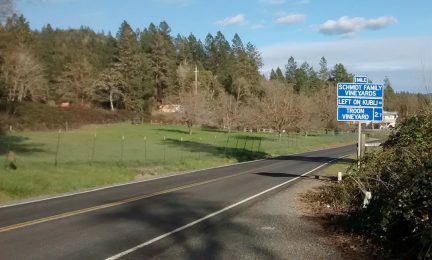 Back on the road, it wasn’t long until I found myself in the two-horse town of Applegate. 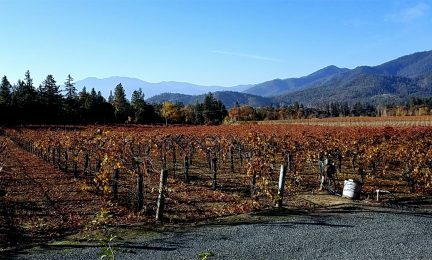 I was very pleased to see that the wine trail was very well signed from the highway, and fears of getting lost or out of cel range melted away as I turned up North Applegate Road. 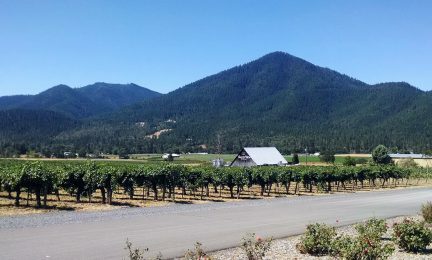 That’s when I truly entered “Wine Country.” The official wine tour listed 4 vineyards along this route, but there were many more, and much to my surprise at least 3 properties with well established vineyards for sale. 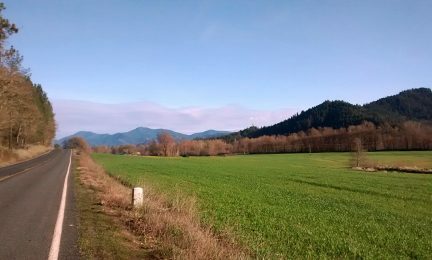 This is about the time that the sun broke through the spring morning clouds, and my trip was flooded with vibrant colors of deep blue skies, sprawling emerald green fields and violet mountains in the distance. I felt completely wrapped in natural beauty, away from traffic and the business that had become my life. The air was so clean and a treat to take in, in long deep breaths. Very prominent signs, especially for being on a off-the-track country road, guided me to Kubli Road where I found Wooldridge Creek Vineyard & Winery just a hop up Slagle Creek Road. I couldn’t believe how isolated this winery felt. It was so easy to get to, but completely tucked away from the rest of the world. So peaceful, so quiet, so stunning. At Wooldridge Creek, I instantly felt as a part of the family. They were so warm and inviting, helping me to feel right at home, sharing stories of the rich history of the area and their winery. 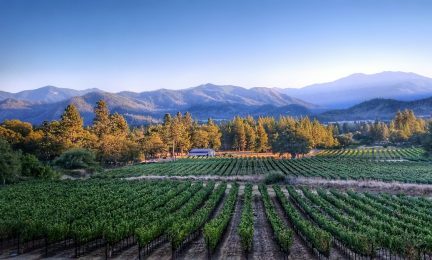 This vineyard & winery is a classic example of the American Dream and great people working together to accomplish amazing things. Here, I got an up close look at their winery process and the equipment used to craft some impressive wines. 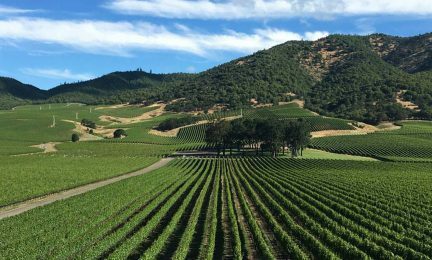 Their vineyard had a large variety of grapes, from the common favorites like Cabernet Sauvignon, Merlo, Syrah, Chardonnay, Pinot Noir and Zinfandel, to special treats including Cabernet Franc, Viognier, Sangiovese, Malbec, and Petit Verdot. They also produce a Temparanillo which I sampled earlier at Red Lily. My world experience of wine was expanding rapidly. After hugs goodbye, as if leaving grandma’s house, I returned down the dead end road that brought me to Wooldridge. The vista before me as I approached N. Applegate road reminded me I should have had my camera out the whole time. Normally I would be apprehensive to stop in the middle of the road to take photos of these amazing vistas, but traffic along the winding country roads was minimal to completely non-existent. I decided to make the most out of the country drive and take photos. 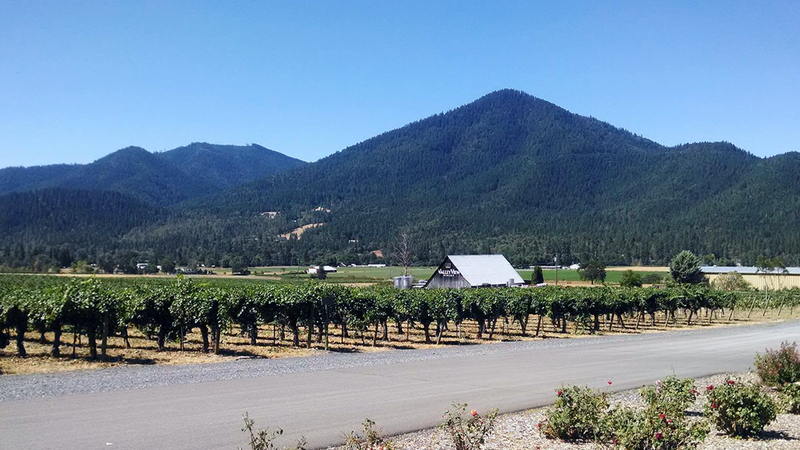 From the intersection of Slagle Creek Road and North Applegate Road, I could see my next destination, Troon Vineyard. These guys really know how it’s done. It was a brand I was familiar with having seen it at the Bella Union at my dinner the night before and in some of my favorite shoppes back home. This tasting room reminded more of the Sonoma valley than the other tasting rooms I’d visited so far. 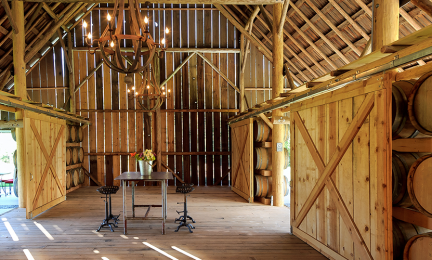 Less rustic, but just as serene as the other tasting rooms. Here, I took advantage of the case discount that came with the Discover Oregon Wine package. I selected their Orange Riesling for it’s unique style – a conversation piece for sure at my next Thanksgiving. For entertaining friends whom prefer a rich red, I selected the M*T, a Malbec/Tannat co-ferment that is sure to impress. Before long I found myself at Rosellas Vineyard & Winery. Such an intimate experience. For the time I was there, I was the center of the sommelier’s world. We talked wines, but only for a minute. By this time I was so curious how to live this majestic rural lifestyle. 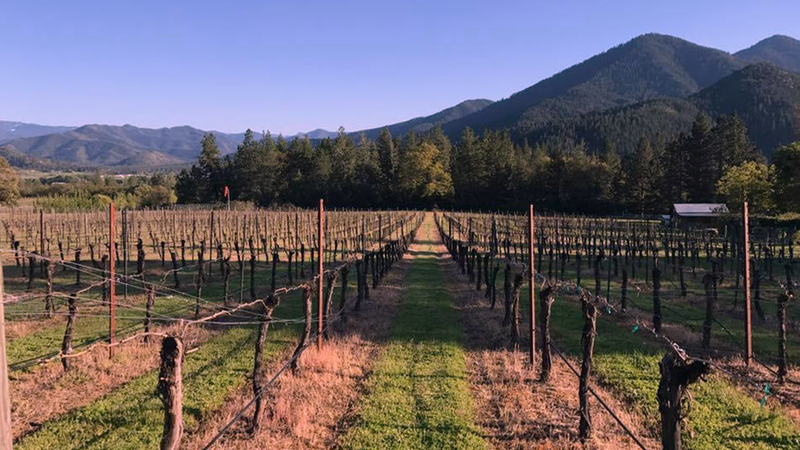 I learned a lot about what it’s like to live with nature, and how important it is to these local vineyards to work with mother nature rather than against her, to protect and nourish her. We talked about complimentary crops that prepare the soil naturally to protect their watershed, about the local wild animals, and shared great laughs and stories. I could have stayed for hours, but it was well into the afternoon and I had even more vineyards and wineries to visit. I found Serra Vineyards and struggled to comprehend how such a stunning venue could be so far out in this countryside. The service and wines explained it all, well worth the picturesque drive to the destination. I should note that all of these vineyards are quite close to one another, yet each feels tucked away in their own beautiful piece of this valley. The proprietors had the nicest things to say about one another! It seemed more like a cooperative more than any kind of competitive environment. I returned back to the McCully House Inn feeling refreshed and content. The peace and serenity of the tour stayed with me in my heart as I enjoyed dinner at Gogi’s and returned to the Cricket Hill tasting room for a night cap before settling into my plush accommodations. I took this tour solo, yet still managed to fall in love. 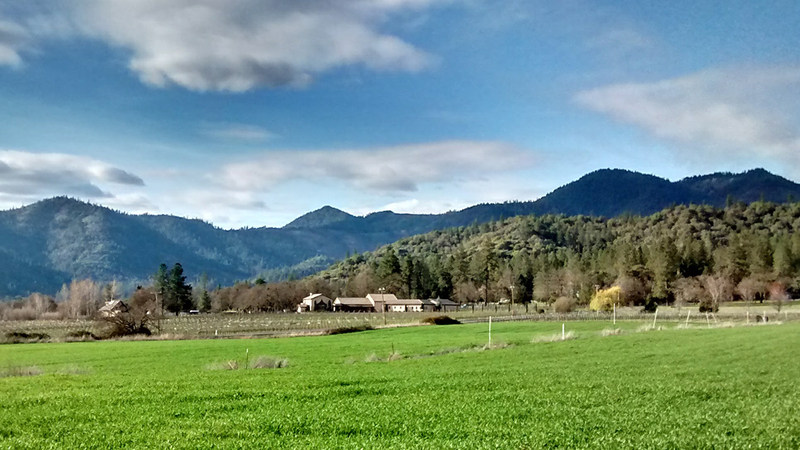 In love with the Applegate Valley. The scenery, the people, the rural pace, the tranquility, the river. Here are my photos along with a few gathered with permissions in the captions. Tap or click to see the full size image. In contrast to my tours through Sonoma and Nappa Valleys, this tour had more of an adventure feel, off the beaten path in what remains of the wild west. It was a causal, intimate experience free of pretension or judgement in my novice tasting skills. I highly recommend this wine tour to everyone – a wine novice like me, to those who can really appreciate the subtle notes that the sommelier’s described to me, to those hoping to fall in love with that someone new, to those celebrating a lifetime of love together. This trip is nothing short of enchanting. Peaceful. Refreshment for the soul.